St Kilda is an inner suburb (neighbourhood) of the metropolitan area of Melbourne, Victoria, Australia, 6 km south-east of Melbourne's Central Business District. 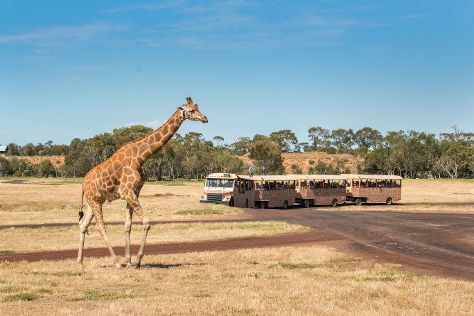 Visiting Werribee Open Range Zoo and Brighton Beach will get you outdoors. Family-friendly places like St. Kilda Beach and Chelsea Beach will thrill your kids. Explore St Kilda's surroundings by going to Dandenong Ranges National Park (in Dandenong), Melbourne Cable Park (in Bangholme) and Mentone beach (in Mentone). And it doesn't end there: examine the collection at Scienceworks, look for gifts at Davey Mac's Gelato, experience rural life at Collingwood Children's Farm, and admire the natural beauty at Rippon Lea. To see other places to visit, photos, more things to do, and tourist information, you can read our St Kilda trip planner. Frankfurt, Germany to St Kilda is an approximately 29-hour flight. The time zone difference when traveling from Frankfurt to St Kilda is 9 hours. In January, St Kilda is much warmer than Frankfurt - with highs of 30°C and lows of 17°C. Finish up your sightseeing early on the 12th (Sat) so you can travel back home.